I think that adding a statement piece of jewelry to your wedding day attire can seem like a classic and somewhat timeless choice. The jewelry can reflect your personality and your personal style by making one simple selection. Add some crystals or even some colored stones to your simple or intricate white dress. Or if you are changing into a tea-length number for your reception why not add a statement necklace that will throw your guests for a loop. Add a pop of color. Add some sparkle. Add a statement necklace that reflects your personality. One of my ALL time favorite designers is Kate Spade. Her jewelry can span from one end of the spectrum to the other. From classic to whimsy. 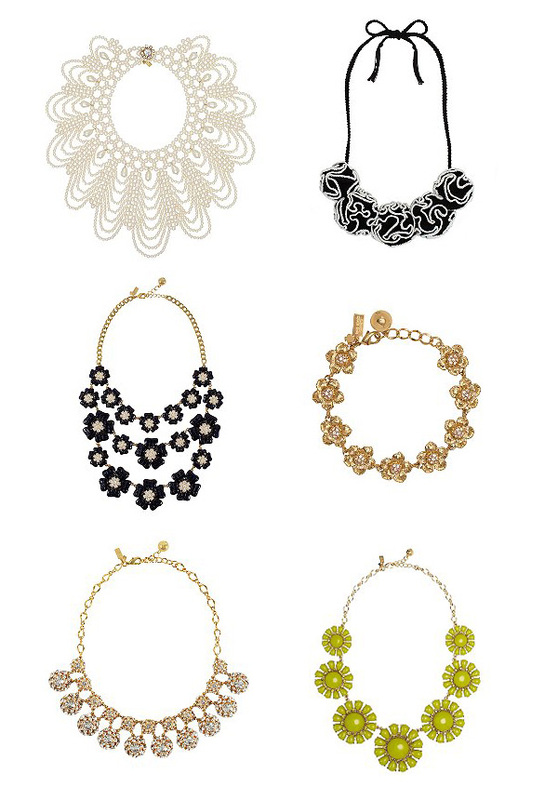 Below are a few of my favorites that would favor any neckline.